How much did Berkshire Hathaway's leverage increase after entering the insurance business in 1967? After acquiring its first insurance company (NICO and its sister carrier NF&M) in March 1967 for $8.6 million, Berkshire’s balance sheet more than doubled. 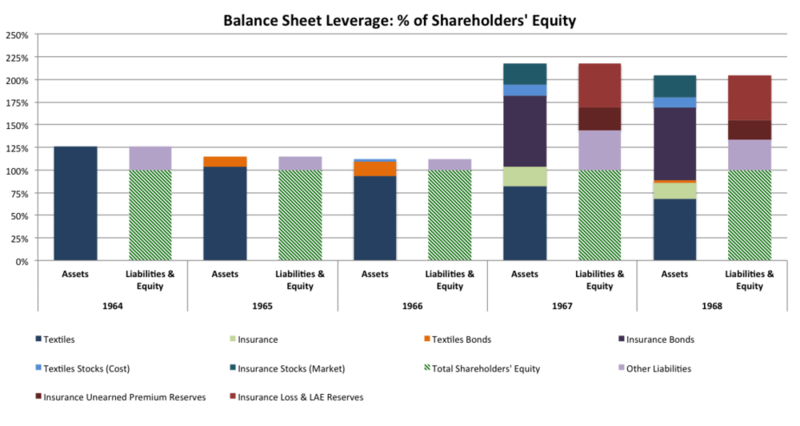 As shown in the chart below, after entering the insurance business, Berkshire’s assets increased from 1.12x (or 112% of) shareholders’ equity at the end of fiscal 1966 to 2.17x (or 217% of) shareholders’ equity at the end of fiscal 1967. The insurance business clearly increased the leverage (debt) inherent in Berkshire’s business model – this makes sense as liability management is the crux of the insurance business (i.e. you pay me X today and for the next year I will owe and pay you Y if something bad happens). As shown in the table below, liabilities increased 991.7% from the end of fiscal 1966 to the end of fiscal 1967, driven primarily by insurance reserve liabilities (unearned premium reserve liabilities and loss & loss adjustment reserve liabilities). Bonds invested by Berkshire’s insurance business comprised the bulk of the incremental gain in assets in 1967. But of course, as we know today, this will change. Common stocks will come to represent a much bigger portion of the insurance business’ investment portfolio, especially through significant capital appreciation over time in the value of individual common stock positions. NOTE: Data presented are for calendar years ending in December except for 1965 and 1966 fiscal years, which ended on 10/2/1965 and 10/1/1966, respectively. Figures for 1967 are for the 15 months ended 12/30/1967. Results through 1978 have been restated to reflect accounting changes in 1979 that required insurance companies to carry equity securities at market value rather than the lower of cost or market. Adjustments have been made by S&C Messina to originally reported financials to approximate such changes, accounting especially for unrealized gains and accompanying deferred tax liabilities at Berkshire’s insurance subsidiaries. Annual percentage changes in book value per share match what Berkshire Hathaway reports today. Berkshire did not fully consolidate the income statement and balance sheet of its insurance subsidiaries until the 1973 10-K filing. S&C Messina has fully consolidated the income statement and balance sheet of all insurance subsidiaries.